This week was a short week since we had Tuesday off due to a snow day! No complaints over here, I just really can’t believe it’s Friday already. Before I talk about more food, I wanted to share this picture of Ava. 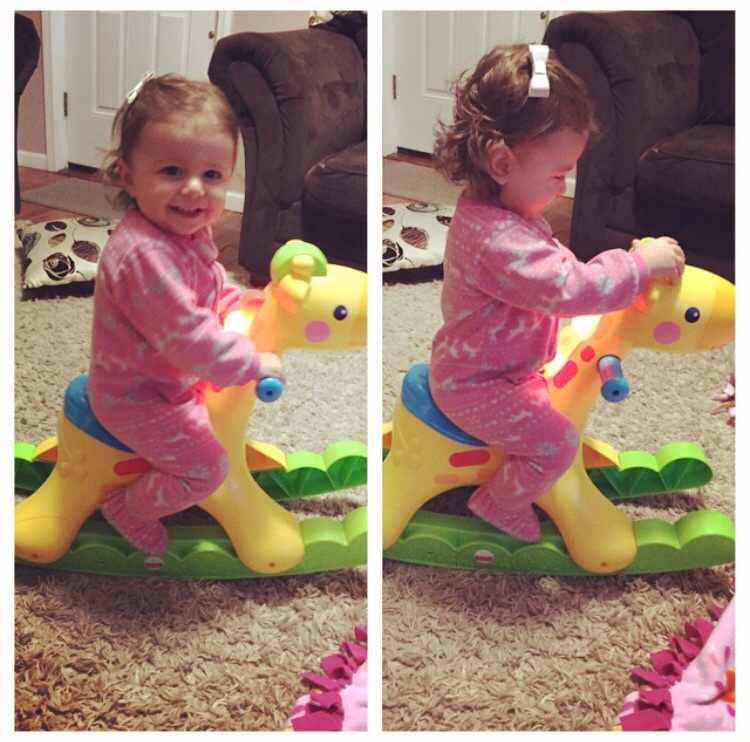 She has been obsessed with rocking on her giraffe this week. She climbs on and off and she loves the tunes this toy plays when she starts rocking. It’s pretty fun to watch her get excited. In case you missed my post yesterday, I shared some of my favorite Super Bowl Game Day recipes with you. I also have one more delicious recipe to share with you. 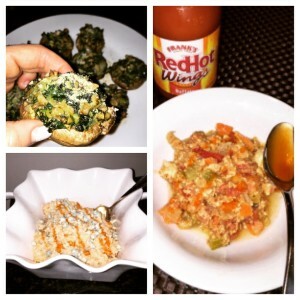 It’s Marc’s Spinach Stuffed Mushrooms! I have requested him to make these on NUMEROUS occasions. 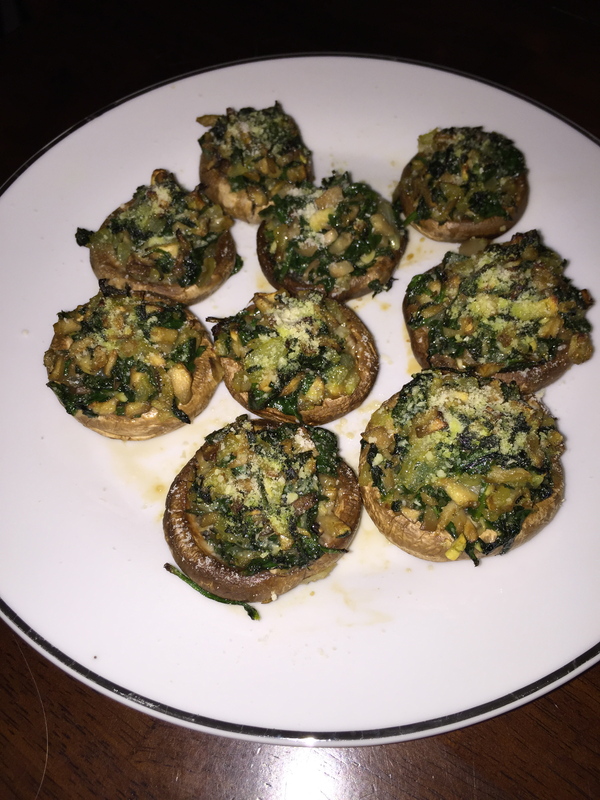 They are pretty easy to make and I can’t help but love the fact that they are also healthy. These will definitely be on our menu this Sunday! Heat oven to 375. Remove the stems from the mushrooms, finely chop the stems and put to the side. Coast a baking sheet with spray. Bake the mushroom caps (stem side down until just tender 10-12 minutes. In a medium skillet drizzle olive oil and turn stove to medium-high heat. Chop onion & garlic finely. Add onion, garlic, and mushroom stems to pan and sauté for 3-4 minutes or until soft. Add the spinach, salt, pepper, and add 1 tbsp of Parmesan cheese. Cook 2-3 minutes. 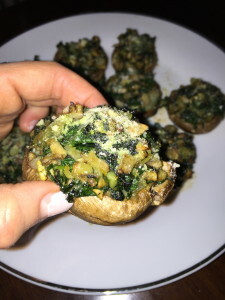 Place the spinach mixture in a bowl and spoon the mixture into the mushroom caps. Sprinkle the top with Parmesan cheese (if you like more, load it on) and bake for 12-15 minutes or until golden brown!! I hope you enjoy them as much as we do! Tonight will be a relaxing night in our house, tomorrow morning I am teaching a Boot Camp class so everyone can work there butts off for the Super Bowl! Living in CT, I should be rooting for the Pats, right? I admit, I’m not a huge football fan much to my boyfriend’s dismay…he is a diehard Giants fan so I suppose we will be cheering on the Seahawks. I will probably pay more attention to the commercials than the game. 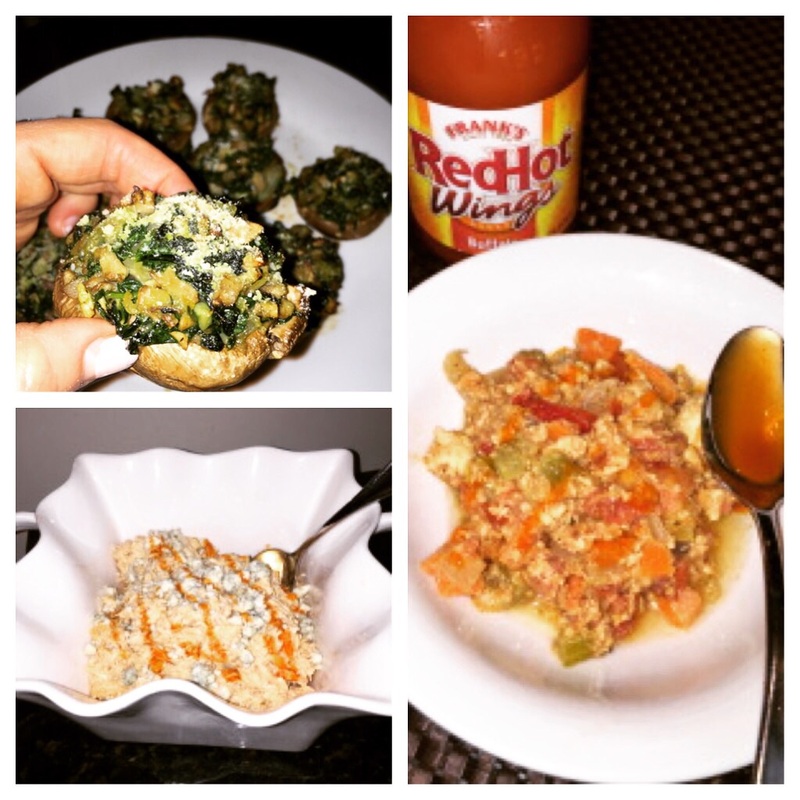 Either way, those mushrooms look like the perfect treat for Sunday! Those mushrooms sound so good! I’ll need to give them a try once I start eating cheese again…I have 4 more days of the Whole30! !